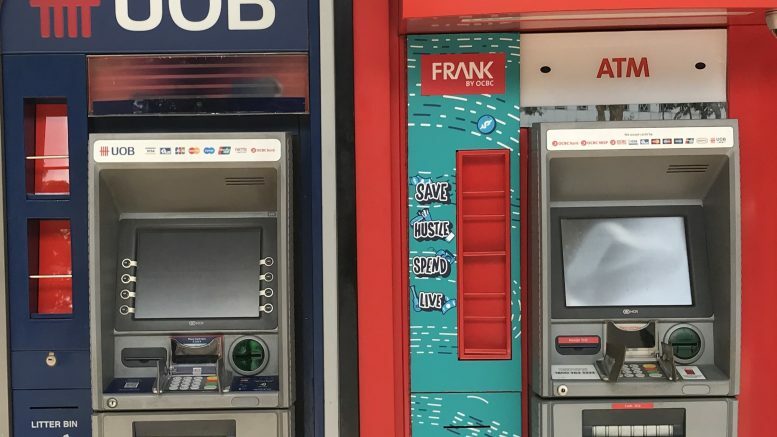 UOB and OCBC Bank ATMs in Singapore. Keppel REIT said on Tuesday that it bought back 2.5 million units in the market at S$1.19 each for a total consideration, including other costs, of S$2.98 million. The REIT manager said all repurchased units would be cancelled. Since the April 2018 start of its buyback mandate, Keppel REIT has bought back 27,842,900 units, or 0.8215 percent of its issued units excluding treasury units at the time its mandate began, it said in a filing to SGX after the market close on Tuesday. SATS said on Tuesday that it bought back 400,000 shares in the market at S$4.55 to S$4.57 each for a total consideration, including other costs, of S$1.82 million. Since the July 2018 start of its buyback mandate, SATS has bought back 2,559,400 shares, or 0.2291 percent of its issued shares excluding treasury shares at the time its mandate began, it said in a filing to SGX after the market close on Tuesday. UOB said on Tuesday that it bought back 60,395 shares in the market at S$24.30 to S$24.66 each for a total consideration, including other costs, of S$1.48 million. Since the April 2018 start of its buyback mandate, UOB has bought back 5,826,456 shares, or 0.3508 percent of its issued shares excluding treasury shares at the time its mandate began, it said in a filing to SGX after the market close on Tuesday. OCBC said on Tuesday that it bought back 100,000 shares in the market at S$11.12 each for a total consideration, including other costs, of S$1.11 million. Since the April 2018 start of its buyback mandate, OCBC has bought back 8,825,000 shares, or 0.211 percent of its issued shares excluding treasury shares at the time the mandate began, it said in a filing to SGX after the market close on Tuesday. Venture Corp. said on Tuesday that it bought back 41,000 shares in the market at S$14.22 each for a total consideration, including other costs, of S$584,389. Since the April 2018 start of its buyback mandate, Venture has bought back 870,000 shares, or 0.303 percent of its issued shares excluding treasury shares at the time its mandate began, it said in a filing to SGX after the market close on Tuesday. Olam International said on Tuesday that it bought back 75,000 shares in the market at S$1.65 to S$1.66 each for a total consideration, including other costs, of S$124,584. Since the April 2018 start of its buyback mandate, Olam has bought back 1.52 million shares, or 0.0477 percent of its issued shares excluding treasury shares at the time the mandate began, it said in a filing to SGX after the market close on Tuesday. SingHaiyi Group said on Tuesday that it bought back 7,835,500 shares in the market at S$0.07642 each for a total consideration, including other costs, of S$599,686. Since the July 2018 start of its buyback mandate, SingHaiyi has bought back 55,176,600 shares, or 1.288 percent of its issued shares excluding treasury shares at the time its mandate began, it said in a filing to SGX after the market close on Tuesday. Stamford Land said on Tuesday that it bought back 150,000 shares in the market at S$0.49 each for a total consideration, including other costs, of S$73,610. Since the July 2018 start of its buyback mandate, Stamford Land has bought back 25,968,800 shares, or 3.005 percent of its issued shares excluding treasury shares at the time its mandate began, it said in a filing to SGX after the market close on Tuesday. Banyan Tree Holdings said on Tuesday that it bought back 45,200 shares in the market at S$0.55 each for a total consideration including other costs of S$25,004. Since the December 2018 start of its buyback mandate, Banyan Tree has bought back 450,900 shares, or 0.05 percent of its issued shares excluding treasury shares at the time its mandate began, it said in a filing to SGX late on Tuesday. The Straits Trading Co.. said on Tuesday that it bought back 8,000 shares in the market at S$2.05 to S$2.06 each for a total consideration, including other costs, of S$16,464. Since the August 2018 start of its buyback mandate, Straits Trading has bought back 222,200 shares, or 0.054 percent of its issued shares excluding treasury shares at the time its mandate began, it said in a filing to SGX after the market close on Tuesday.